“Though it [the Russian economy – Ed.] has a lot in common with Western economies and the world economy as a whole, its crisis is connected not with domestic problems, but rather with outside hits,” Jianzhong said. “To my mind, the crisis that Russia is facing now is short –term and not that significant. But countries with a huge government debt, or economies with average debt have crises caused by domestic factors and, compared to Russia, their problems are much more serious and will last longer,” he added. Despite the fact that these economies resorted to such methods as quantitative easing in order to prevent recession the burden of their loans is still weighing, and they can’t solve this problem, he said. The ratings agencies had no grounds to lower Russia’s rating, as its economic environment isn’t a reason, Jianzhong said, referring to S&P cutting Russia’s rating to ‘junk’ status. 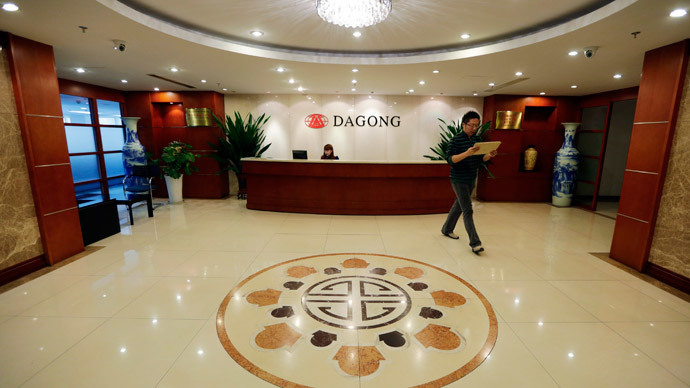 Dagong Global gave the country an A rating, while the American-based Standard and Poor's downgraded it to ‘junk’. In January, Russia and China announced they would create a jointly-owned rating agency to rival those in the West by the end of the year. This week the Russian State Duma received a draft bill from the Ministry of Finance that puts together a framework for the activity of foreign rating agencies in Russia.The bill proposes fees and accreditation for carrying out such financial activities. Jianzhong says the ‘Big Three’ of S&P, Moody’s and Fitch aren’t able to give an impartial assessment of a country’s real economic environment which, in turn, leads to miscalculation and crises. “The global credit crisis of 2008 occurred because of their miscalculations. During US congressional hearings in 2008 they openly admitted they made a serious mistake,” Jianzhong said. "The Department of Justice has recently penalized S&P, also for making a mistake. Studies by Dagong have shown that the ‘Big Three’s’ methods of discussion and assessment are wrong,” he said. “Now the whole world is experiencing the impact of the global crisis, which occurred due to their miscalculations." For a long time the West’s biggest rating agencies have given the USA and some European countries the highest AAA ratings, seriously overestimating their real potential to repay debt. In Jianzhong’s opinion, the value of these countries’ debt is greater than the value of the goods they create. “The US credit rating is now A-, they have the largest debt burden worldwide, and if the dollar wasn’t an international reserve currency, America wouldn’t be able to pay its creditors,” he said. According to Jianzhong, if nothing changes, the world can easily face a similar crisis in the near future.